Join the Wait List below to be notified the moment Course Craft re-opens. Our premium course on starting an online-course based business. Your email is safe. We'll email you from time-to-time. 100% no-spam. I’ve created and launched several 6- and 7-figure businesses over the last 10 years, from scratch, on a shoestring budget. If you want a real, value-based, sustainable business - if you want to escape the frustrations of chasing from one online marketing fad to the next - then creating online courses is the way to go. That's why I've created the Course Craft System. Course Craft is an online course consisting of video lessons, worksheets and exercises. The course contains step-by-step, proven, no-nonsense advice to walk you through my entire process for going from zero to creating a $200 online course that sells an average of once per day. 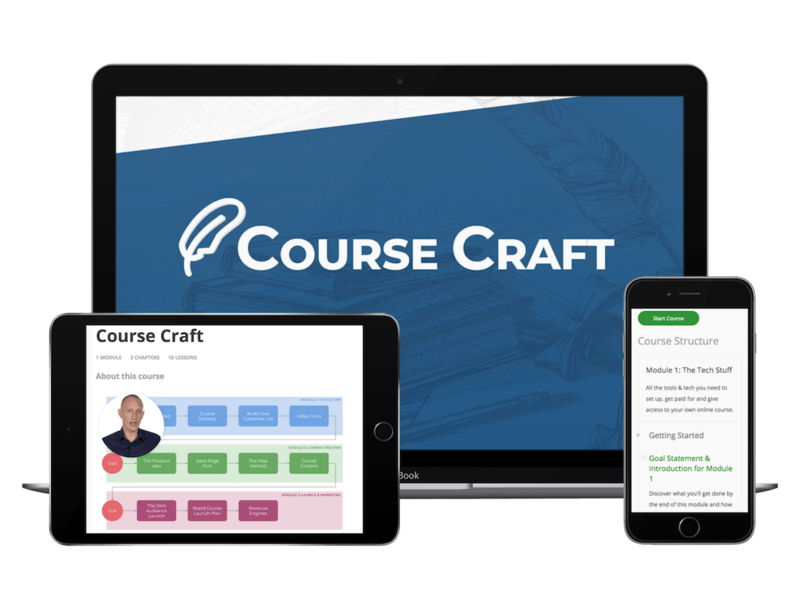 What are people saying about Course Craft? "Stunned at the quality and depth of information"
"This course is ground breaking"
Join the waitlist to be notified the moment Course Craft re-opens!